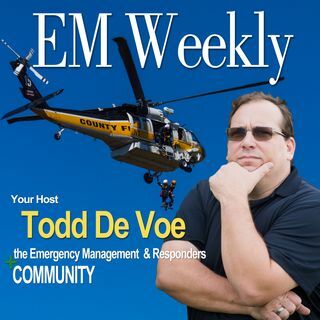 This week we talk to Anthony (Tony) Alexiou about the field of contract Emergency Management. As things change over the years we are seeing more and more roles for the Contract Emergency Manager. Tony and I discuss his time as a emergency manager consultant, overseeing UASI funds, and how he sees the fit of the EM in the system. Tony, with over 15 years of experience in this industry, manages the Homeland Security and Emergency Management practice at the Triage Group. Tony started ... Más informaciones his career as a consultant with All Hands Consulting and worked as a UASI management contractor for the Miami Regional UASI – covering the four counties of southeastern Florida. While there, he implemented and oversaw major projects such as regional communication and notification systems; training and exercise planning, design and execution; plan writing and review and operational support for the City of Miami Emergency Operations Center. By the end of his time in Miami, Tony was acting as the Planning Chief for the Miami EOC and had responded to major events such as hurricanes Wilma, Rita and Katrina, among many others. Following Miami, Tony was named Deputy Director for the Montgomery County Office of Emergency Management and Homeland Security in Maryland. In this position, Tony oversaw all operational and planning aspects of homeland security and emergency management for this major Washington, DC suburban county. He was also named Chair of the Washington, DC Regional Emergency Manager’s Committee by his peers and served in a leadership role on this committee for nearly three years. Tony has been a Certified Emergency Manager (CEM) since 2013. He completed his undergraduate work at the University of Western Ontario in London, Ontario and did his graduate work at the University of North Texas in Denton, Texas.